The Matanuska Experiment Farm, 38 miles northeast of Anchorage near the junction of the Glenn and Parks Highways, was the last of seven agricultural experiment stations established by the federal government between 1898 and 1917. The first six stations were in Sitka, Kodiak, Kenai, Rampart, Copper Center and Fairbanks. After the Alaska Engineering Commission initiated construction of the Alaska Railroad from Anchorage to Fairbanks in 1914, people began filing homestead entries along the railroad right-of-way in the Matanuska and Susitna Valleys, as well as along trails and waterways in the area. Including existing homesteads, hundreds of applications for entry were soon filed. A 1955 Matanuska Experiment Station publication, “Matanuska Memoir,” states that the peak year was 1916 when 111 homestead entries were recorded. The U.S. Department of Agriculture conducted a rudimentary soils reconnaissance in 1914 and approved an experiment station for the area in 1915. A 240-acre parcel for the station was selected just north of the Alaska Railroad, about six miles north of the Knik River and seven miles east of the new town of Wasilla. Work on the station began in April of 1917. The manager’s house was constructed that year. The house, shown in the drawing, is a one-and-a-half-story wood-frame Arts and Crafts bungalow with a gabled roof and dormer. The 32-foot by 42-foot building is sheathed with beveled siding. 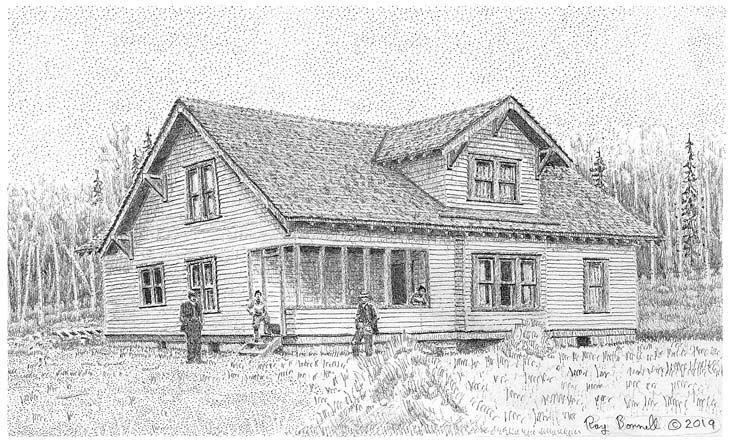 The drawing shows the house as it looked in 1918, soon after completion. The term “bungalow” refers to the style of the house, rather than the modern meaning of a small house. Bungalow comes from the Hindi word “bangla,” meaning a house in the “Bengal” style. The style was brought to Great Britain from India, and then came to the Americas. Typically, bungalows were one to one-and-a-half-stories tall, with low-pitched roofs, wide eaves and large verandas or porches. The style was modified during the Arts and Crafts Movement (antithesis to Industrial Design) of the early 1900s to emphasize simplified design, hand craftsmanship, the use of natural building materials, and incorporating exposed structural features such as the triangular knee braces under the eaves. The station’s first few years were spent clearing land, erecting new buildings and beginning research projects. Between 1917 and 1929, five structures that still stand were built: the manager’s house, the Kodiak Cottage (a residence originally located at the Kodiak experiment station but moved to Matanuska in 1922), a mess hall, a dormitory, and another residence called the Herdsman’s House. Alaska’s agricultural experiment station program suffered a major setback during the Great Depression. Due to the nation’s financial calamity, the federal government dropped support for the experiment station program. Four stations had already closed: Kenai (1908), Copper Center (1908), Kodiak (1922), and Rampart (1923). Of the three Alaska stations still in operation, the Sitka station closed in 1930, the Fairbanks station was transferred to the Alaska Agricultural College in 1931 and the Matanuska station transferred to the college the next year. Territorial funds were strained already, and work at the two remaining stations suffered for years afterward. It was not until 1947 that the federal government, in partnership with the, by then, University of Alaska, resumed research activities at the experiment farms. At the same time, the university also assumed responsibility for a Territorial Game Commission experimental fur farm in Petersburg (closed in 1974). Over the years the farm, now called the Matanuska Experiment Farm and Extension Center, has expanded. According to the University of Alaska Fairbanks School of Natural Resources and Extension, the farm now includes 260 acres of cultivated land and 800 acres of forest land which is used for research and education. This article is reprinted with the permission of the author. Ray Bonnell is a freelance artist, writer and longtime Fairbanks resident. See more of his artwork at www.pingostudio.us.